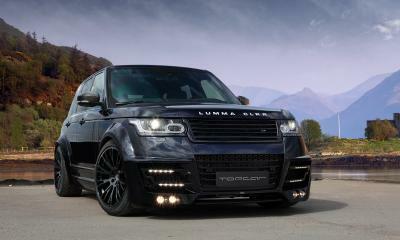 With its sporty wide-body look, LUMMA Design’s CLR R conversion for the new Range Rover that debuted last year leaves a distinctively dramatic impression that is hard to beat.To kick off the 2014 season, LUMMA Design now presents a comprehensive carbon-fibre package as well as increased performance for the turbo-diesel engine version of the Range Rover. The complete CLR R package offers a sporty looking wide body with new bumpers, wide wheel arch flares, lower door panels, and an aggressively re-styled lightweight carbon-fibre bonnet with additional air scoops. The new carbon-fibre package include a new front grille, door handles, mirror covers, rear spoiler lip, rear and side trim strips and an anti-glare panel for the bonnet. 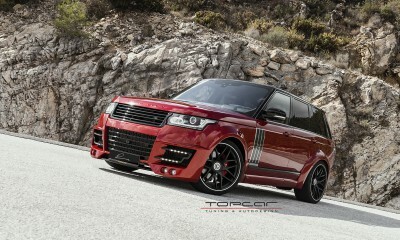 This adds a unique twist to the aristocratic Range Rover, already visually emboldened by the LUMMA CLR R conversion. Appropriate alloy wheels to fill out the big arches come in the form of 12.0J x 22-inch LUMMA Exclusive alloy wheels, wearing Vredestein Ultrac Sessenta SUV high performance tyres. 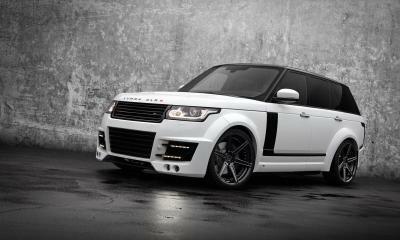 Extra performance for the diesel-engined variant is provided by the LUMMA D-Box, developed specifically for the Range Rover. This raises the standard 4.4-liter V8 diesel engine’s output from 250kW/340 hp and 700 Nm to 272 kW/370 hp, with 800 Nm of torque. As the beefier torque curve means less effort is required to achieve a given pace, the D-box can potentially improve the average fuel consumption by about 0.5 L/100 km in normal driving. This motor upgrade package costs 749 euros plus VAT including warranty, and can be fitted at LUMMA Design’s premises in Germany for an additional 90 Euro. A stylish engine cover in Racing Red with carbon-fibre inlay and LUMMA logo tops off the engine upgrade. LUMMA Design also offers a high quality stainless steel sports exhaust system with four tailpipes that lowers backpressure for a few extra horsepower, and adds a deep, sonorous soundtrack. Only available in conjunction with the CLR R styling package, which integrates the end pipes into the rear apron, this exhaust system comes with a choice of exhaust tips in either black or chrome. The petrol version also has a sound flap control. 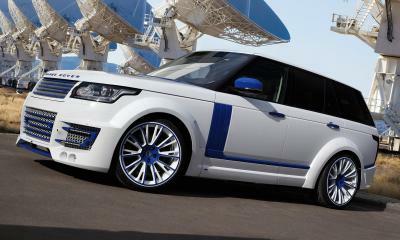 To match the more extrovert exterior of their Range Rover CLR R, LUMMA Design offer a beautifully crafted interior package that adds a finishing touch to the plush cabin. The major component here is a re-trim of the seats in Alcantara with a diamond-quilted pattern. The dashboard, door panels and centre console are finished in a stylish combination of Alcantara, fine leather with carbon-fibre trim inserts. A highlight of this very special interior is the ergonomically shaped, flat-bottomed sports steering wheel with perforated Alcantara covering the grip area. The top and bottom of the wheel rim is covered by unique carbon look leather. Finishing off the remodelled cabin are smaller but no less important details such as the aluminium pedal set with non-slip rubber feet, stainless-steel door sill scuff plates with illuminated LUMMA logo, and LUMMA Design carpet mats. 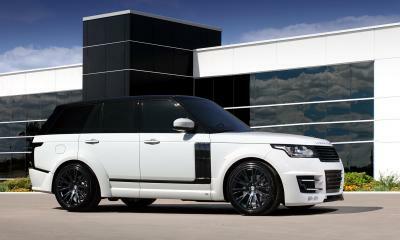 All components for the new Range Rover are available now.